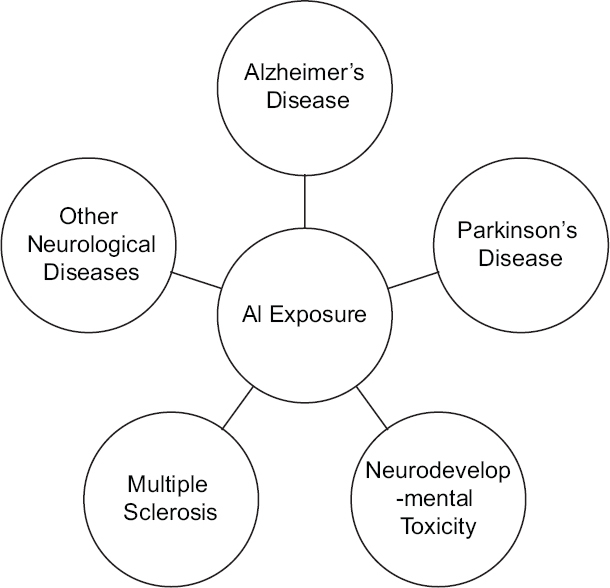 In light of these information, the aim of this review is to summarize various hypotheses, which link Al and neurodegeneration, and to determine the roles of Al exposure through different sources including diet, environment, and occupation. AD is characterized by a neurological progressive impairment affecting several cognitive domains, behavior, and personality. AD is accompanied by changes in cerebral functions as a result of biochemical incidents, each of which is related with each other. These cerebral dysfunctions result in difficulties in receiving/processing new information, difficulties in doing previously known activities/works, confusion, not participating in social activities, loss of memory, and personality changes. Typical neuropathological signs of the disease are intracellular neurofibrillary tangles (hyper phosphorylation of tau protein), deposition of extracellular senile plaques (hyper phosphorylation of AβP, optimal losses of synapses and neurons in hippocampal and cerebral cortical regions, cortical and subcortical atrophy, and cerebrovascular amyloids.,, Early-onset AD is related to familial gene mutations, which results in increased secretion of neurotoxic AβP. Apolipoprotein E susceptibility gene is a risk factor in AD. The late-onset AD, detected in 85%–95% of the cases of AD, is not related with any gene mutation. The etiological factors of AD are not exactly known. However, it is thought that genetic factors, oxidative stress, infectious factors, and environmental factors are playing role in AD. As there is no sufficient genetic information about AD, it is thought that environmental factors interact with other factors and provide a basis for the formation of this disease. Al is one of these environmental factors. The hypothesis, stating that Al was one of the environmental factors in the pathogenesis of AD, was named as “Al hypothesis,” based on various neuro-toxicological, analytical, and epidemiological data found in the 1960s.,, The beginning of the hypothesis, stating that Al was included in the etiology of AD, is revealed by observing the neurofibrillary degeneration after the intracerebral injection of Al into rabbit's brain. The increasing Al levels were reported in 1973 in postmortem brain samples of people with AD and they were related with AD. PD, the widely observed neurodegenerative disorder after AD, is characterized with selective death of neurons in substantia nigra. By leading genetic and/or acquired disorders in ubiquitin-proteasome system, it can cause the deposition of ubiquitin-added proteins and neuronal deaths. It has been suggested that several molecular mechanisms including mitochondrial dysfunction, impairment of protein quality pathways, oxidative/nitrative stress, microglia activation, and inflammation are responsible for neuronal death in PD pathogenesis., In addition to the neuronal loss, the other neuropathological hallmark of PD is the presence of Lewy bodies in the surviving neurons. These neurons are eosinophilic cytoplasmic inclusions containing aggregates of protein such as α-synuclein (α-syn). PD is a neurodegenerative disorder, affecting speaking and motor abilities of the patient, which is characterized with tremors in the face, hands and jaw, muscle rigidity, and slow physical activities. PD occurs as a result of the decrease of stimuli by basal ganglia in motor cortex, depending on the death of neurons in globus pallidus and substantia nigra, which normally synthesizes and releases epinephrine and dopamine. PD can progress with head injuries/traumas, encephalitic virus, 1-methyl-4-phenyl-1, 2, 3, 6-tetrahydropyridine (MPTP, contaminant including drugs such as heroin) and exposure to some pesticides. As Al +3 toxicity causes AD-type dementia in some patients with PD, it is thought that Al is playing a role in PD. Moreover, catecholamine neurotransmitters and catechol parts of epinephrine and dopamine are important binding parts of Al +3. Although epinephrine and dopamine are weak Mg +2 binders in millimolar levels, they bind Al +3 in nanomolar levels. It was detected that there were high Al +3 and Fe +3 levels indicating the death of neurons in neuromelanin granules and Lewy bodies of substantia nigra and locus coeruleus (the blue part of brain stem in which there are neurons including neuro-epinephrine) parts in the brains of patients with PD. As a result of iron metabolism impaired by Al +3, high levels of iron accumulate in the neurons of patients with PD, but there is no increase observed in the levels of ferritin. Consequently, oxidative damage occurs, which causes neural deaths in substantia nigra and other parts of the brain affected from PD. The relationship between PD and Al has also been demonstrated in gastric ulcer patients due to the use of Al-containing antacids. Another indirect evidence between Al and PD is the ability of Al to activate the monoamine oxidase B. This enzyme increases with age and PD. In addition, monoamine oxidase B may promote α-syn fibril formation. It is suggested that this situation may explain the relationship between neurotoxic metals and PD. Activation of the NF-kB transcription factor and triggering of inflammatory processes have been found to occur synergistically after simultaneous treatment of experimental animals with a dopaminergic neurotoxin, MPTP, and low-level Al in drinking water. Yasui et al. found that Al concentration in the substantia nigra, caudate nucleus, and globus pallidus was higher in PD brains and significantly higher in gray matter and the basal ganglia. In parallel, Good et al. found increased Al levels in the neuromelanin granules of two of three PD cases. For individuals with chronic kidney disease, there is a bilateral risk associated with Al. First, these patients are exposed to Al as part of the treatment process, and second, their ability to excrete Al from the body is reduced because of the disease. Chronic kidney disease patients also have difficulty to excrete phosphate from the body. The high blood phosphate levels of these patients increase the risk of death from bone and heart diseases. Al hydroxide began to be used as a phosphate binder in patients with chronic kidney disease to limit phosphate absorption in the 1960s. The use of Al-containing phosphate binders, especially with alkalinizing citrate solution (Shohl's solution), has been found to be more risky to form Al citrate complex which consequently increase the absorption of Al., Dialysis encephalopathy, first described in 1972, has emerged as a complication of prolonged hemodialysis exposure. Patients with dialysis encephalopathy have difficulty in speaking (dysarthria), movement planning disorder (dyspraxia), unconsciousness and psychosis following ataxia, personality changes, myoclonic movements, electroencephalographic abnormalities, convulsions, and dementia. The mechanisms of dialysis encephalopathy are not exactly known. Al passes through the blood–brain barrier through the transferrin and accumulates in the area of the brain cortex that is rich in transferrin receptors. This region where the distribution of pyramidal neurons is made requires a high degree of Fe for the synthesis of respiratory chain enzymes. The damage in this area is thought to have resulted in neuropathy. It was found that Al levels in brain, muscle, and other tissues of dialysis encephalopathy patients were high. Serum Al levels >80 μg/L have been associated with dialysis encephalopathy. In addition, cerebral cortical Al concentrations of patients with dialysis encephalopathy were reported as 10–25 μg/g dry brain weight. The Al content of the dialysis fluids used in many cases with encephalopathy was determined to be >200 μg/L. Nowadays, the exposure of dialysis patients to Al is the minimum, as the Al level of dialysis fluid in the majority of dialysis centers is <10 μg/L. Exposure to Al in humans is mainly through diet. Al exposure to the diet can be through contamination of foods, food additives, water, and Al kitchenwares. The amount of Al in foods differs according to their Al content or the interaction of nutrients with the Al kitchenwares in the process of storage, preparation, and cooking of foods. Although the amount of Al in the soil is high (3%–10%), many plants contain low amounts of Al. When the pH of the soil is <4.5–5.0, Al is dissolved in water and absorbed by the root of the plant. The amount of Al in animal-derived foods depends on the low amount of Al in animal feed and on the limited availability of Al to animals in animal-derived products such as eggs and milk. As a result, most of the animal-derived foods contain <1 μg/g Al. Except for foods and additives including Al, Al exposure with diet can increase due to storage of foods in Al containers and Al cookware (pot, pan, tray, coffeepot, etc.) used in food preparation and cooking and contact with folios. Although the amount of Al exposed as a result of the consumption of foods prepared in Al cookware was lower than the amount of Al that was taken from other sources, in case of frequent usage of Al cookware, the Al migration to food from these cookware increased significantly. Moreover, factors such as cooking time and temperature, the composition of food, pH value, and the existence of other substances (organic acids, salt, and other ions) also affect Al migrations to foods. Under normal circumstances, the Al migration from substances contact with the food constitutes a small part of the total dietary exposure. In addition, the use of Al pots, plates, or folios with foods such as apple, tomato, and salted fish increases the Al migrations to these foods. Furthermore, it was reported that the use of Al plates and trays, especially with acidic foods such as tomato, pickle, and vinegar, caused the increase of Al migrations., The provisional tolerable weekly intake level of Al was reevaluated by the Joint Expert Committee on Food Additives in 2011 in light of new toxicological studies. According to this evaluation, the provisional tolerable weekly intake level, previously published as 1 mg/kg body weight (BW), was changed as 2 mg/kg BW. Although Al is found in the earth crust in a large amount, the majority of natural water contain very small amounts of dissolved Al (<10 μg/L) and marine water contain 1 μg/L of Al. Al in marine water generally accumulates in unicellular algae. The development of modern industrial technologies and the spreading of chemicals into the atmosphere may cause acid rains. When natural water acidify due to acid rain or when natural water are treated with Al sulfate to obtain drinking water, the amount of Al in natural water increases. Strong mineral acids such as sulfur and nitrogen oxalic acid in acid rain can cause mobilization of Al by dissolving it from the soil. The amount of acid in lakes and rivers acidified by acid rain can reach up to 700 μg/L. This level is generally regarded as a toxic level for fish. In addition, natural events such as soil erosion, fragmentation of rocks, and volcanic activity result in the removal and redistribution of Al in other environmental components, including water, air, and biota. The Al concentration of air varies between 20 and 500 ng/m 3 in rural areas and 1000 and 6000 ng/m 3 in urban areas. Humans are exposed to environmental alumina at a concentration of 200 ng/m 3 and a particle size of <5 μm. A person with a normal ventilation volume of 20 m 3 is 40 μg of Al breath/day. With the increasing use of Al in everyday life and industry, Al exposure has become inevitable. Potential Al exposure is expected to be higher in people working in certain occupational groups (such as Al refining and metal industries, printing and publishing, and automotive business). Occupational exposure to Al particles during the production of Al dusts reached 100 mg/m 3 in the 1950s. However, the exposure levels for Al dust production in the 1990s were reported to be 5–21 mg/m 3 and the exposure levels for the production of Al fuels were reported to be 1–4 mg/m 3. During Al welding process, 0.2–5 mg/m 3 Al is produced. Powder production and welding often lead to occupational Al exposure at high levels. Cognitive deficits, attention deficits, learning and verbal or visual disorders, and “concept formation” problems have been reported in workers exposed to occupational Al exposure. It is well established that Al is a neurotoxic agent. However, the link of Al to the etiology of various serious neurological disorders such as AD remains still unclear. In spite of this uncertainty, a number of epidemiological reports concerning Al exposure and the risks of neurological disorders are available in the scientific literature. An important reason for this uncertainty is the ethical concerns of tests conducted in humans. Thus, many studies have been conducted on animals and animals have been exposed to Al throughout their lives so that the effects of Al can be fully observed in many of these studies. Al exposure should be kept to minimum since the potential effects on human health of Al are not fully understood. Future studies should be done in vulnerable subgroups of population including children, patients receiving antacids or Al-containing pharmeteucials on a daily basis, patients with reduced renal function, and patients on parenteral nutrition regimens that are likely to be affected by possible adverse health effects of Al. In addition, gender, age, and Al interactions need to be determined. One of the most important challanges in future epidemiological studies is to decide which variables should be controlled. In addition, experimental studies should be more focused and translational. In this context, exposure dose, dose–response effects, and time lapse between exposures and cognitive assessments are very important. Domingo JL. Aluminium. In: Benjamin C, editor. Encyclopedia of Food Sciences and Nutrition. 2nd ed. Oxford: Academic Press; 2003. p. 160-6. Aronson JK. Aluminium. In: Meyler's Side Effects of Drugs: The International Encyclopedia of Adverse Drug Reactions and Interactions. 15th ed. Amsterdam: Elsevier; 2006. p. 97-105. Vargel C. Food Industry. 1st ed. Oxford: Elseiver; 2004. Moore PB, Day JP, Taylor GA, Ferrier IN, Fifield LK, Edwardson JA, et al. Absorption of aluminium-26 in Alzheimer's disease, measured using accelerator mass spectrometry. Dement Geriatr Cogn Disord 2000;11:66-9. Wilhelm M, Jäger DE, Ohnesorge FK. Aluminium toxicokinetics. Pharmacol Toxicol 1990;66:4-9. Glynn AW, Sparén A, Danielsson LG, Sundström B, Jorhem L. The influence of complexing agents on the solubility and absorption of aluminium in rats exposed to aluminium in water. Food Addit Contam 2001;18:515-23. Colomina MT, Gómez M, Domingo JL, Corbella J. Lack of maternal and developmental toxicity in mice given high doses of aluminium hydroxide and ascorbic acid during gestation. Pharmacol Toxicol 1994;74:236-9. Domingo JL, Gómez M, Sanchez DJ, Llobet JM, Corbella J. Effect of various dietary constituents on gastrointestinal absorption of Al from drinking water and diet. Res Commun Chem Pathol Pharmacol 1993;79:377-80. Domingo JL, Gómez M, Llobet JM, del Castillo D, Corbella J. Influence of citric, ascorbic and lactic acids on the gastrointestinal absorption of Al in uremic rats. Nephron 1994;66:108-9. Nestel AW, Meyers AM, Paiker J, Rollin HB. Effect of calcium supplement preparation containing small amounts of citrate on the absorption of aluminium in normal subjects and in renal failure patients. Nephron 1994;68:197-201. Krewski D, Yokel RA, Nieboer E, Borchelt D, Cohen J, Harry J, et al. Human health risk assessment for aluminium, aluminium oxide, and aluminium hydroxide. J Toxicol Environ Health B Crit Rev 2007;10 Suppl 1:1-269. Provan SD, Yokel RA. Reduced intestinal calcium and dietary calcium intake, increased aluminum absorption, and tissue concentration in the rat. Biol Trace Elem Res 1989;23:119-32. Taneda M. Effect of aluminum on rat brain. Enhancement by calcium deficiency. Hokkaido Igaku Zasshi 1984;59:312-37. Moon J, Davison A, Bandy B. Vitamin D and Al absorption. CMAJ 1992;147:1308-13. Colomina MT, Peris-Sampedro F. Aluminum and Alzheimer's disease. Adv Neurobiol 2017;18:183-97. Yokel RA, McNamara PJ. Aluminium toxicokinetics: An updated minireview. Pharmacol Toxicol 2001;88:159-67. Priest ND. The biological behaviour and bioavailability of aluminium in man, with special reference to studies employing aluminium-26 as a tracer: Review and study update. J Environ Monit 2004;6:375-403. Nayak P. Aluminum: Impacts and disease. Environ Res 2002;89:101-15. Walton JR. Chronic aluminum intake causes Alzheimer's disease: Applying Sir Austin Bradford Hill's causality criteria. J Alzheimers Dis 2014;40:765-838. Shimizu H, Mori T, Koyama M, Sekiya M, Ooami H. A correlative study of the aluminum content and aging changes of the brain in non-demented elderly subjects. Nihon Ronen Igakkai Zasshi 1994;31:950-60. Bondy SC. Low levels of aluminum can lead to behavioral and morphological changes associated with Alzheimer's disease and age-related neurodegeneration. Neurotoxicology 2016;52:222-9. Maya S, Prakash T, Madhu KD, Goli D. Multifaceted effects of aluminium in neurodegenerative diseases: A review. Biomed Pharmacother 2016;83:746-54. Kawahara M, Kato-Negishi M. Link between aluminum and the pathogenesis of Alzheimer's disease: The integration of the aluminum and amyloid cascade hypotheses. Int J Alzheimers Dis 2011;2011:276393. Latha KS, Anitha S, Rao KS, Viswamitra MA. Molecular understanding of aluminum-induced topological changes in (CCG) 12 triplet repeats: Relevance to neurological disorders. Biochim Biophys Acta 2002;1588:56-64. Bharathi KS, Jagannatha Rao KS, Stein R. First evidence on induced topological changes in supercoiled DNA by an aluminium D-aspartate complex. J Biol Inorg Chem 2003;8:823-30. Muma NA, Singer SM. Aluminum-induced neuropathology: Transient changes in microtubule-associated proteins. Neurotoxicol Teratol 1996;18:679-90. Parhad IM, Krekoski CA, Mathew A, Tran PM. Neuronal gene expression in Al myelopathy. Cell Mol Neurobiol 1989;9:123-38. Oshiro S, Kawahara M, Mika S, Muramoto K, Kobayashi K, Ishige R, et al. Aluminum taken up by transferrin-independent iron uptake affects the iron metabolism in rat cortical cells. J Biochem 1998;123:42-6. Lukiw WJ, LeBlanc HJ, Carver LA, McLachlan DR, Bazan NG. Run-on gene transcription in human neocortical nuclei: Inhibition by nanomolar Al and implications for neurodegenerative disease. J Mol Neurosci 1998;11:67-78. Lin R, Chen X, Li W, Han Y, Liu P, Pi R, et al. Exposure to metal ions regulates mRNA levels of APP and BACE1 in PC12 cells: Blockage by curcumin. Neurosci Lett 2008;440:344-7. Luo Y, Niu F, Sun Z, Cao W, Zhang X, Guan D, et al. Altered expression of abeta metabolism-associated molecules from D-galactose/AlCl(3) induced mouse brain. Mech Ageing Dev 2009;130:248-52. Socorro JM, Olmo R, Teijón C, Blanco MD, Teijón JM. Analysis of aluminum-yeast hexokinase interaction: Modifications on protein structure and functionality. J Protein Chem 2000;19:199-208. Lai JC, Blass JP. Inhibition of brain glycolysis by aluminum. J Neurochem 1984;42:438-46. Cho SW, Joshi JG. Inactivation of Bakers' yeast glucose-6-phosphate dehydrogenase by aluminum. Biochemistry 1989;28:3613-8. Kumar V, Bal A, Gill KD. Impairment of mitochondrial energy metabolism in different regions of rat brain following chronic exposure to aluminium. Brain Res 2008;1232:94-103. Lemire J, Mailloux R, Puiseux-Dao S, Appanna VD. Aluminum-induced defective mitochondrial metabolism perturbs cytoskeletal dynamics in human astrocytoma cells. J Neurosci Res 2009;87:1474-83. Shetty KT, Veeranna, Guru SC. Phosphatase activity against neurofilament proteins from bovine spinal cord: Effect of aluminium and neuropsychoactive drugs. Neurosci Lett 1992;137:83-6. Johnson GV, Cogdill KW, Jope RS. Oral aluminum alters in vitro protein phosphorylation and kinase activities in rat brain. Neurobiol Aging 1990;11:209-16. Yamamoto H, Saitoh Y, Yasugawa S, Miyamoto E. Dephosphorylation of tau factor by protein phosphatase 2A in synaptosomal cytosol fractions, and inhibition by aluminum. J Neurochem 1990;55:683-90.
el-Sebae AH, Abdel-Ghany ME, Shalloway D, Abou Zeid MM, Blancato J, Saleh MA, et al. Aluminum interaction with human brain tau protein phosphorylation by various kinases. J Environ Sci Health B 1993;28:763-77. Guy SP, Jones D, Mann DM, Itzhaki RF. Human neuroblastoma cells treated with aluminium express an epitope associated with Alzheimer's disease neurofibrillary tangles. Neurosci Lett 1991;121:166-8. Kawahara M, Muramoto K, Kobayashi K, Kuroda Y. Functional and morphological changes in cultured neurons of rat Cerebral cortex induced by long-term application of aluminum. Biochem Biophys Res Commun 1992;189:1317-22. Praticò D, Uryu K, Sung S, Tang S, Trojanowski JQ, Lee VM, et al. Aluminum modulates brain amyloidosis through oxidative stress in APP transgenic mice. FASEB J 2002;16:1138-40. Rodella LF, Ricci F, Borsani E, Stacchiotti A, Foglio E, Favero G, et al. Aluminium exposure induces Alzheimer's disease-like histopathological alterations in mouse brain. Histol Histopathol 2008;23:433-9. Giorgianni CM, D'Arrigo G, Brecciaroli R, Abbate A, Spatari G, Tringali MA, et al. Neurocognitive effects in welders exposed to aluminium. Toxicol Ind Health 2014;30:347-56. Akila R, Stollery BT, Riihimäki V. Decrements in cognitive performance in metal inert gas welders exposed to aluminium. Occup Environ Med 1999;56:632-9. Kiesswetter E, Schäper M, Buchta M, Schaller KH, Rossbach B, Scherhag H, et al. Longitudinal study on potential neurotoxic effects of aluminium: I. Assessment of exposure and neurobehavioural performance of al welders in the train and truck construction industry over 4 years. Int Arch Occup Environ Health 2007;81:41-67. Buchta AM, Kiesswetter BE, Schäper BM, Zschiesche CW, Schaller DK, Kuhlmann AA, et al. Neurotoxicity of exposures to aluminium welding fumes in the truck trailer construction industry. Environ Toxicol Pharmacol 2005;19:677-85. Altmann P, Dhanesha U, Hamon C, Cunningham J, Blair J, Marsh F, et al. Disturbance of cerebral function by aluminium in haemodialysis patients without overt aluminium toxicity. Lancet 1989;2:7-12. Bolla KI, Milstien S, Briefel G, Wieler L, Kaufman S. Dihydropteridine reductase activity: Lack of association with serum aluminum levels and cognitive functioning in patients with end-stage renal disease. Neurology 1991;41:1806-9. Jackson M, Warrington EK, Roe CJ, Baker LR. Cognitive function in hemodialysis patients. Clin Nephrol 1987;27:26-30. Exley C, Mamutse G, Korchazhkina O, Pye E, Strekopytov S, Polwart A, et al. Elevated urinary excretion of aluminium and iron in multiple sclerosis. Mult Scler 2006;12:533-40. Kawahara M. Effects of aluminum on the nervous system and its possible link with neurodegenerative diseases. J Alzheimers Dis 2005;8:171-82. Bansal VK, Bansal S. Nervous system disorders in dialysis patients. Handb Clin Neurol 2014;119:395-404. Laabdar W, Elgot A, Gamrani H. The protective effect of curcumin on dopaminergic system after chronic aluminium intoxication: Possible link with Parkinson's disease. Parkinsonism Relat Disord 2016;22:e188. Wang Z, Wei X, Yang J, Suo J, Chen J, Liu X, et al. Chronic exposure to aluminum and risk of Alzheimer's disease: A meta-analysis. Neurosci Lett 2016;610:200-6. Pedersen NL. Reaching the limits of genome-wide significance in Alzheimer disease: Back to the environment. JAMA 2010;303:1864-5. Sjögren B, Iregren A, Montelius J, Yokel RA. Aluminum. In: Fowler BA, Nordberg M, editors. Handbook on the Toxicology of Metals. 4th ed. San Diego: Academic Press; 2015. p. 549-64. Gupta VB, Anitha S, Hegde ML, Zecca L, Garruto RM, Ravid R, et al. Aluminium in Alzheimer's disease: Are we still at a crossroad? Cell Mol Life Sci 2005;62:143-58. Ferreira PC, Piai Kde A, Takayanagui AM, Segura-Muñoz SI. Aluminum as a risk factor for Alzheimer's disease. Rev Lat Am Enfermagem 2008;16:151-7. Yokel RA. Aluminum. In: Benjamin C, editor. Encyclopedia of Human Nutrition. 3rd ed. Waltham: Academic Press; 2013. p. 57-63. Klatzo I, Wisniewski H, Streicher E. Experimental production of neurofibrillary degeneration. I. Light microscopic observations. J Neuropathol Exp Neurol 1965;24:187-99. Crapper DR, Krishnan SS, Dalton AJ. Brain aluminum distribution in Alzheimer's disease and experimental neurofibrillary degeneration. Science 1973;180:511-3. Martyn CN, Barker DJ, Osmond C, Harris EC, Edwardson JA, Lacey RF, et al. Geographical relation between Alzheimer's disease and aluminum in drinking water. Lancet 1989;1:59-62. Exley C. The aluminium-amyloid cascade hypothesis and Alzheimer's disease. Subcell Biochem 2005;38:225-34. Bondy SC. Prolonged exposure to low levels of aluminum leads to changes associated with brain aging and neurodegeneration. Toxicology 2014;315:1-7. Bhattacharjee S, Zhao Y, Hill JM, Percy ME, Lukiw WJ. Aluminum and its potential contribution to Alzheimer's disease (AD). Front Aging Neurosci 2014;6:62. Bharathi V, Vasudevaraju P, Govindaraju M, Palanisamy AP, Sambamurti K, Rao KS, et al. Molecular toxicity of aluminium in relation to neurodegeneration. Indian J Med Res 2008;128:545-56. Zhang QL, Jia L, Jiao X, Guo WL, Ji JW, Yang HL, et al. APP/PS1 transgenic mice treated with aluminum: An update of Alzheimer's disease model. Int J Immunopathol Pharmacol 2012;25:49-58. Alexandrov PN, Zhao Y, Jones BM, Bhattacharjee S, Lukiw WJ. Expression of the phagocytosis-essential protein TREM2 is down-regulated by an Al-induced miRNA-34a in a murine microglial cell line. J Inorg Biochem 2013;128:267-9. Lukiw WJ, Pogue AI. Induction of specific micro RNA (miRNA) species by ROS-generating metal sulfates in primary human brain cells. J Inorg Biochem 2007;101:1265-9. Flaten TP. Aluminium as a risk factor in Alzheimer's disease, with emphasis on drinking water. Brain Res Bull 2001;55:187-96. Frisardi V, Solfrizzi V, Capurso C, Kehoe PG, Imbimbo BP, Santamato A, et al. Aluminum in the diet and Alzheimer's disease: From current epidemiology to possible disease-modifying treatment. J Alzheimers Dis 2010;20:17-30. Zatta P, Drago D, Bolognin S, Sensi SL. Alzheimer's disease, metal ions and metal homeostatic therapy. Trends Pharmacol Sci 2009;30:346-55. Bolognin S, Messori L, Drago D, Gabbiani C, Cendron L, Zatta P, et al. Aluminum, copper, iron and zinc differentially alter amyloid-aβ(1-42) aggregation and toxicity. Int J Biochem Cell Biol 2011;43:877-85. Akiyama H, Hosokawa M, Kametani F, Kondo H, Chiba M, Fukushima M, et al. Long-term oral intake of aluminium or zinc does not accelerate Alzheimer pathology in aβPP and aβPP/tau transgenic mice. Neuropathology 2012;32:390-7. Ribes D, Colomina MT, Vicens P, Domingo JL. Impaired spatial learning and unaltered neurogenesis in a transgenic model of Alzheimer's disease after oral aluminum exposure. Curr Alzheimer Res 2010;7:401-8. McLachlan DR, Bergeron C, Smith JE, Boomer D, Rifat SL. Risk for neuropathologically confirmed Alzheimer's disease and residual aluminum in municipal drinking water employing weighted residential histories. Neurology 1996;46:401-5. Neri LC, Hewitt D. Aluminium, Alzheimer's disease, and drinking water. Lancet 1991;338:390. Chin-Chan M, Navarro-Yepes J, Quintanilla-Vega B. Environmental pollutants as risk factors for neurodegenerative disorders: Alzheimer and Parkinson diseases. Front Cell Neurosci 2015;9:124. Goldman SM. Environmental toxins and Parkinson's disease. Annu Rev Pharmacol Toxicol 2014;54:141-64. Wirdefeldt K, Adami HO, Cole P, Trichopoulos D, Mandel J. Epidemiology and etiology of Parkinson's disease: A review of the evidence. Eur J Epidemiol 2011;26 Suppl 1:S1-58. Hirsch EC, Brandel JP, Galle P, Javoy-Agid F, Agid Y. Iron and aluminum increase in the substantia nigra of patients with Parkinson's disease: An X-ray microanalysis. J Neurochem 1991;56:446-51. Altschuler E. Al-containing antacids as a cause of idiopathic Parkin-son's disease. Med Hypotheses 1999;53:22-3. Zatta P, Zambenedetti P, Milanese M. Activation of monoamine oxidase type-B by aluminum in rat brain homogenate. Neuroreport 1999;10:3645-8. Burke WJ, Kumar VB, Pandey N, Panneton WM, Gan Q, Franko MW, et al. Aggregation of alpha-synuclein by DOPAL, the monoamine oxidase metabolite of dopamine. Acta Neuropathol 2008;115:193-203. Uversky VN, Li J, Fink AL. Metal-triggered structural transformations, aggregation, and fibrillation of human alpha-synuclein. A possible molecular NK between Parkinson's disease and heavy metal exposure. J Biol Chem 2001;276:44284-96. Yasui M, Kihira T, Ota K. Calcium, magnesium and Al concentrations in Parkinson's disease. Neurotoxicology 1991;13:593-600. Good PF, Olanow CW, Perl DP. Neuromelanin-containing neurons of the substantia nigra accumulate iron and aluminum in Parkinson's disease: A LAMMA study. Brain Res 1992;593:343-6. Shoenfeld Y, Agmon-Levin N. 'ASIA'-autoimmune/inflammatory syndrome induced by adjuvants. J Autoimmun 2011;36:4-8. Álvarez-Soria MJ, Hernández-González A, Carrasco-García de León S, del Real-Francia MÁ, Gallardo-Alcañiz MJ, López-Gómez JL, et al. Demyelinating disease and vaccination of the human papillomavirus. Rev Neurol 2011;52:472-6. Murphy CP, Cox RL, Harden EA, Stevens DA, Heye MM, Herzig RH, et al. Encephalopathy and seizures induced by intravesical alum irrigations. Bone Marrow Transplant 1992;10:383-5. Bakir AA, Hryhorczuk DO, Ahmed S, Hessl SM, Levy PS, Spengler R, et al. Hyperaluminemia in renal failure: The influence of age and citrate intake. Clin Nephrol 1989;31:40-4. Hewitt CD, Poole CL, Westervelt FB Jr., Savory J, Wills MR. Risks of simultaneous therapy with oral aluminium and citrate compounds. Lancet 1988;2:849. Alfrey AC, LeGendre GR, Kaehny WD. The dialysis encephalopathy syndrome. Possible aluminum intoxication. N Engl J Med 1976;294:184-8. Priest ND. Encyclopedia of Human Nutrition. 2nd ed. Oxford: Elsevier; 2005. p. 69-76. Nieboer E, Gibson BL, Oxman AD, Kramer JR. Health effects of Al: A critical review with emphasis on Al in drinking water. Environ Rev 1995;3:29-81. WHO/IPCS. Environmental Health Criteria 194, Aluminium. Geneva: WHO/IPCS; 1997. Centers for Disease Control and Prevention. Elevated Serum Al Levels in Hemodialysis Patients Associated with Use of Electric Pumps. Wyoming; 2007. Matsumoto H. Cell biology of aluminum toxicity and tolerance in higher plants. Int Rev Cytol 2000;200:1-46. Aguilar F, Autrup H, Barlow S, Castle L, Crebelli R, Dekant W, et al. Safety of aluminium from dietary intake scientific opinion of the panel on food additives, flavourings, processing aids and food contact materials (AFC). EFSA J 2008;754:1-34. Joint FAO/WHO Expert Committee on Food Additives. Evaluation of Certain Food Additives and Contaminants. World Health Organization Technical Report Series 960, Geneva; 2011. Bondy SC. Encyclopedia of Neuroscience. Oxford: Academic Press; 2009. p. 253-7. Mıtchell J, Mannıng GB, Molyneux M, Lane RE. Pulmonary fibrosis in workers exposed to finely powdered aluminium. Br J Ind Med 1961;18:10-23. Letzel S, Schaller K, Angerer J, Drexler H, Weber A, Schmid K, et al. Biological monitoring of occupational aluminium powder exposure. Occup Hyg 1996;3:271-80.